SeaWorld still has a big "Blackfish" problem at its flagship theme park in San Diego. The company reported earnings that missed Wall Street's forecasts Thursday morning and a slight decline in attendance from a year ago. Shares of SeaWorld (SEAS) plunged more than 6% on the news. SeaWorld has come under fire for its treatment of killer whales, or orcas, ever since the unflattering "Blackfish" documentary aired in theaters in the summer of 2013 and on CNN in the fall of that year. Animal rights organization PETA also launched a massive campaign against SeaWorld. PETA has accused the company of treating orcas cruelly and that animals live shorter lives in captivity than they would in the wild. An #AskSeaWorld social media event in March wound up backfiring on the company as many people took to Twitter to ask the company why its parking lots were bigger than tanks for the killer whales. Even toymaker Mattel (MAT) has said it will stop making SeaWorld-themed Barbies. And legendary anthropologist Jane Goodall said in April that SeaWorld "should be closed down." SeaWorld has fought back. It has taken numerous steps to boost its image with a series of ads that feature SeaWorld employees discussing the care that animals receive at its parks. The company has also said in the past that PETA has been spreading lies. 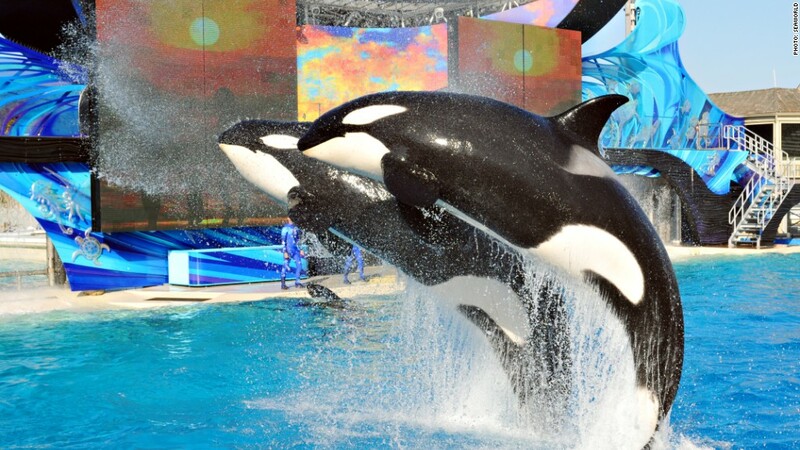 But as SeaWorld's latest earnings show, it seems to be losing the public relations battle. Although overall attendance for SeaWorld -- which also owns the Busch Gardens theme parks -- was down just 0.4% in the quarter, the company said that the decline in visitors was mainly in San Diego. SeaWorld didn't address "Blackfish" or PETA by name in its earnings release or a conference call with analysts. But the negative perception of the company is clearly the reason fewer people are going to see Shamu in Southern California. SeaWorld said the attendance dip was due to "brand challenges and is being addressed through the company's reputation campaign, which is designed to share facts and correct misinformation." During the conference call with analysts, the word "reputation" came up 13 times. And CEO Joel Manby tried to reassure investors that things are improving. "The San Diego park is definitely stabilizing. The attendance decline a year ago was quite dramatic. This year it is very, very much lower, like from a double digit to a low single digit or mid-single digit kind of range," he said. But PETA was quick to respond to SeaWorld's lackluster results, saying that the company's "downward spiral was revealed with another drop in attendance, even during its busiest season." SeaWorld has other problems in the Golden State as well. Last month, the California Coastal Commission approved SeaWorld's $100 million plan to increase the size of its whale habitat. But a condition of that approval was that SeaWorld cannot breed the orcas it currently has in captivity in the state of California. That's not good news for the company, which needs more whales to fill those tanks. SeaWorld has vowed to fight the ban, describing it as "overreaching." Making matters worse for the company, SeaWorld has also faced challenges in Texas. SeaWorld said attendance was down in San Antonio due to a mix of bad weather, fewer promotional offerings and increased competition from rival theme parks in the state, particularly Six Flags. SeaWorld's stock has lagged the performance of Six Flags (SIX)and theme park owner Cedar Fair (FUN) by a wide margin this year. And the stock is down about 35% since it went public in 2013. The company used to be owned by beer giant Anheuser-Busch InBev (BUD) and was bought by private equity firm Blackstone (BX) in 2009. Blackstone is still its largest shareholder. CNNMoney's Aaron Smith and Katie Lobosco contributed to this report.